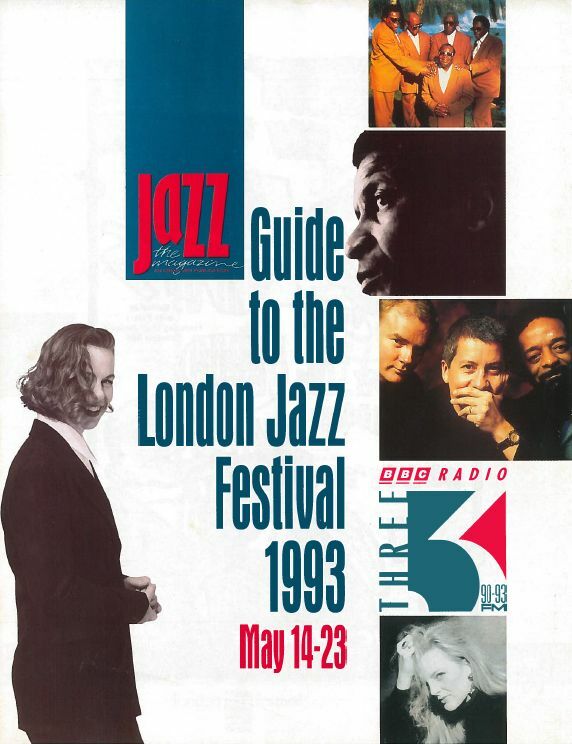 The London Jazz Festival began in 1993, the guide to the new event a pull-out section of the magazine Jazz and a free supplement to The Observer rather than a brochure per se. London in the 1990s was a city only just starting to come out of a fifty year post-war population decline, but by 2014, as a result of the highly successful Olympic Games in 2012 and its pre-eminence on the global financial stage, Forbes magazine had designated London the ‘most influential city in the world’. 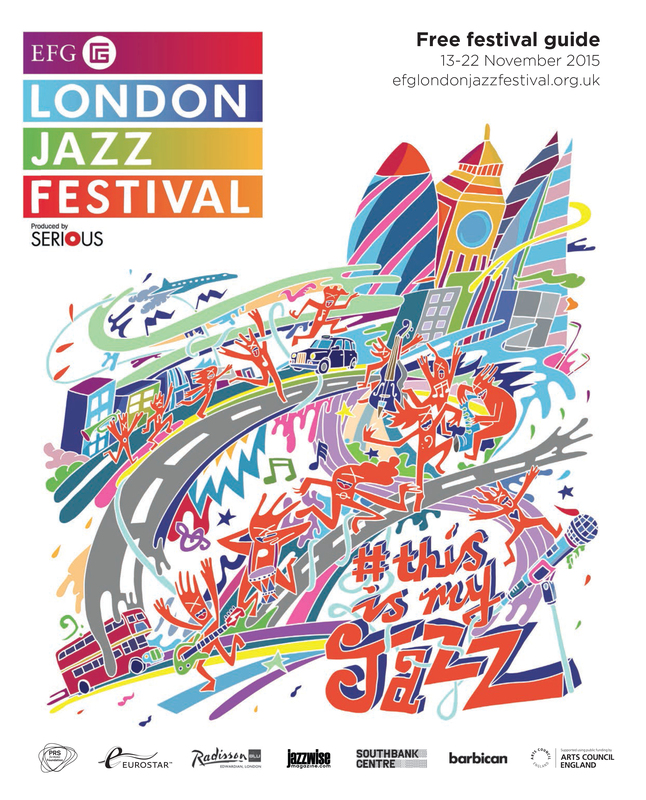 As the Festival has changed over the years, so too has the look and feel of the brochure, and it is also interesting to note that the way in which the Festival has used London imagery over the years, sometimes placing the city front and centre and other times focusing on jazz. 1994 and 1995 foreground London rather than jazz, the famous black hackney cab appearing on both. 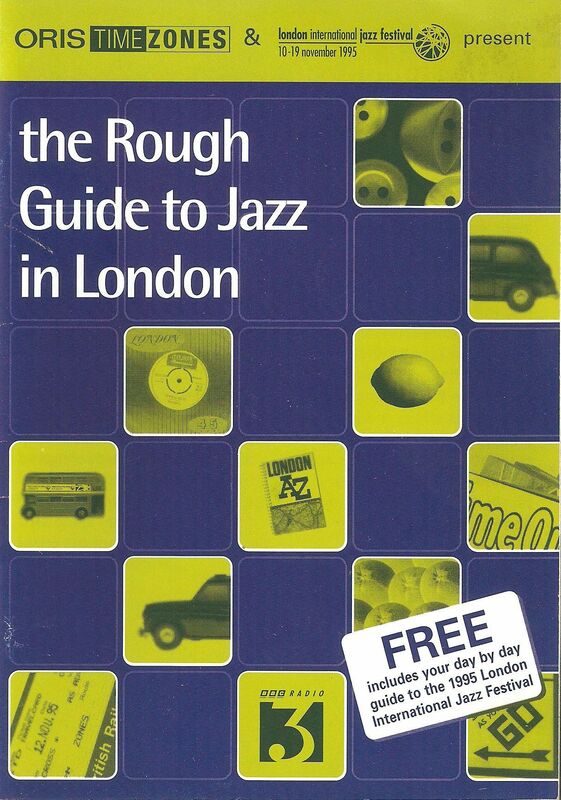 The 1995 mini programme (produced in association with the Rough Guides as well as ORIS, BBC Radio 3 and London Arts Board) draws on London imagery, including black hackney cab, toy Routemaster bus, London A-Z, Time Out, Monopoly board (‘Go’ square), travelcard, but also a lemon and some oranges (a reference to Cockney rhyming slang for St Clements? ), some buttons, and a London Records 45”. The transport theme is continued inside: the introduction is faux stamped ‘Jazz Office November 1995 London’ and the transport images appear throughout. 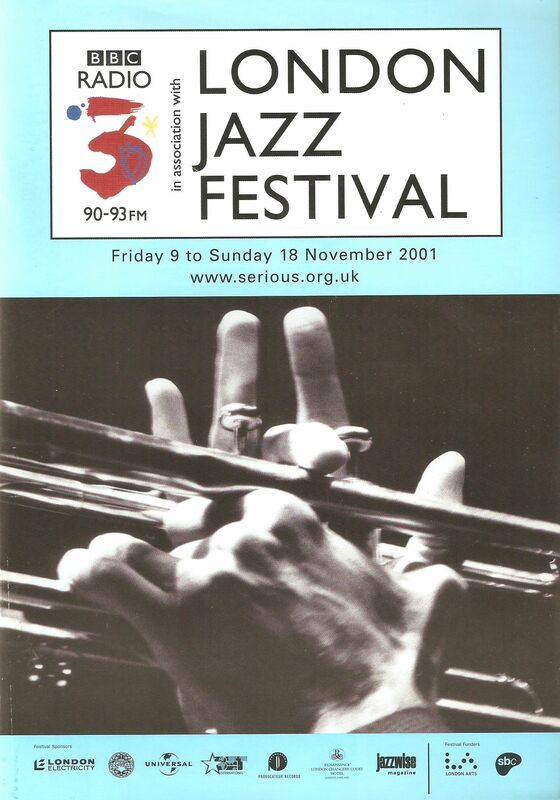 The red and black branding of the 1990s gave a cohesion to the new festival, which foregrounds the title sponsor, Oris, rather than necessarily giving away too much information about the event from the outside, although the inside is filled with black and white images of various jazz musicians in the festival. 2000-2002 sees that black & white imagery move to the front cover, as these three years feature close-up photography of jazz musicians and their instruments – as finance director Ope Igbinyemi says, ‘There was a point when we had hands everywhere, a few fingers, this and that’. 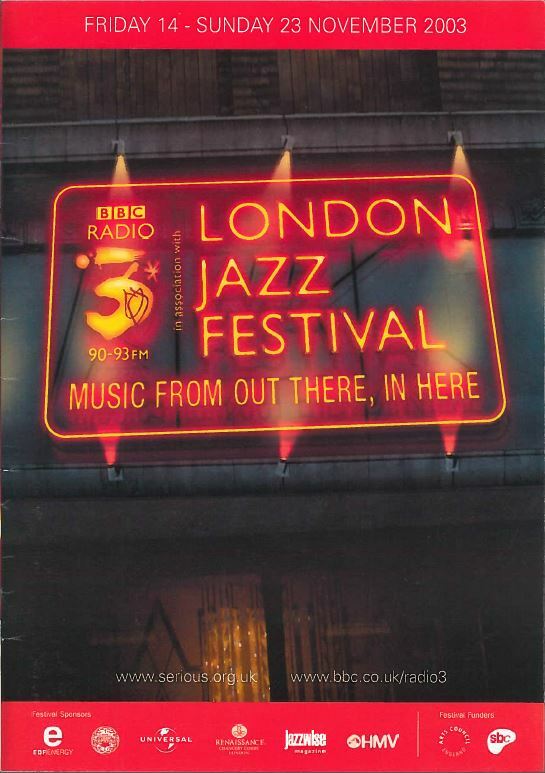 The 2001 brochure is also the first to feature the BBC Radio 3 logo, ‘in association with’, to indicate the relationship between the Festival and its new principal broadcast partner, which continued until 2012. The gritty, urban ‘Music From Out There, In Here’ neon signage of 2003-2005 is up next, utilising the classic symbol of industrial cities: the red brick wall. It is the first time that the Festival uses a slogan, and it is one which is particularly apt, as it encapsulates the inclusive pan-cultural vision of the Festival, one which imports music from all over the world into London, but which, read another way, reflects the way in which the Festival provides a platform for the music being made in London itself. The exuberant 2007 big-jazz-hair cover is bookended by the slightly hit and miss graphic design of 2006 and 2008. As director Claire Whitaker describes, ‘That [2007 programme image] was a landmark one. People just loved that, and I think nothing encapsulates it more than … How she looks is how I feel in a lot of our concerts; that kind of joy’. The artwork for 2009 to 2012 changes tack entirely to feature specially commissioned abstract artworks, the aim being to attract audiences who might attend art galleries but not yet jazz festivals. As Amy Pearce says, the Festival was expanding and audiences were growing and they had to think more about the design, i.e. ‘What would make somebody pick this up who isn’t a jazz fan?’ As the festival market has expanded in the new millennium, so too festivals like the London Jazz Festival have had to expand both their programming and look to attract a bigger and more diverse audience. 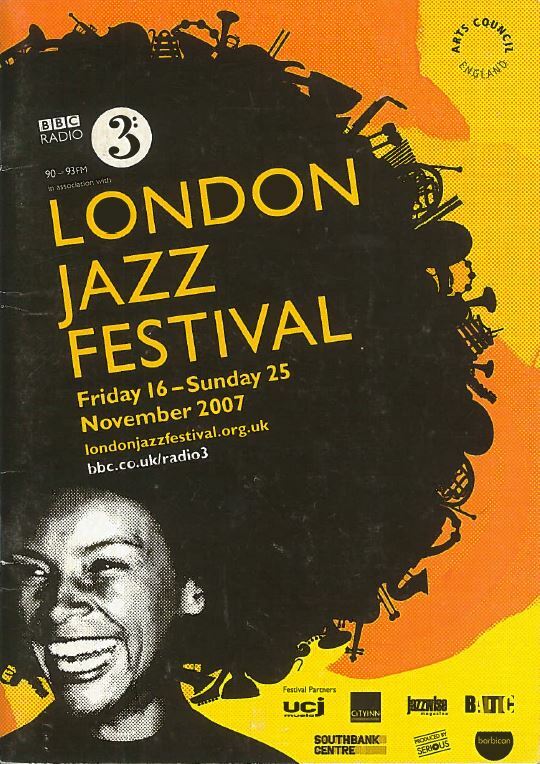 Thus as London and its jazz festival has grown and developed, so too has the aesthetic of the brochure. As Amy Pearce, Serious’ associate director of production, says, ‘I think what I’ve become increasingly aware of is how much your front cover of the brochure defines your programme … I’ve become really aware of how the visual is really integral and the whole look and feel of the festival isn’t just a nice addition, it’s absolutely fundamental to what we’re trying to do with the programme and the Festival’s development … You want a visual that reflects the programme that you’ve created, so to me that is exciting, dynamic, it’s got depth, it’s got different areas that you can look it, it feels alive, it’s inspirational, as I hope our programme is’. 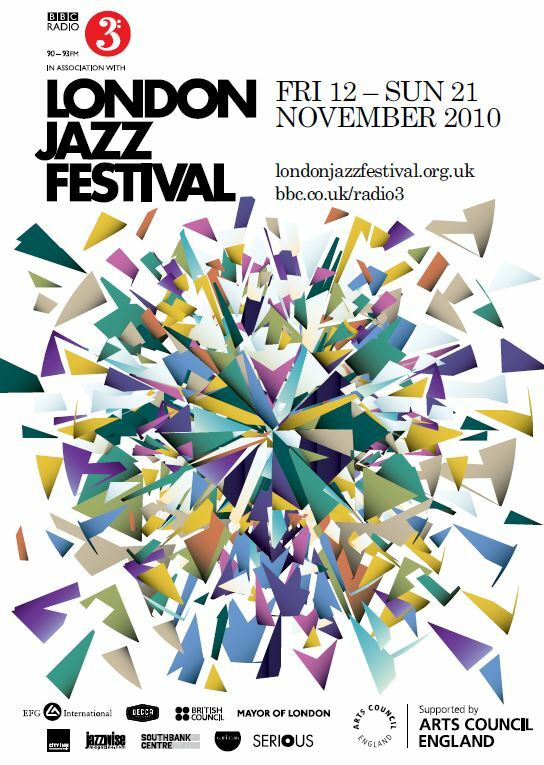 Also check out this article about the Festival’s artwork by Cog Design, who worked with the London Jazz Festival between 1994 and 2008.